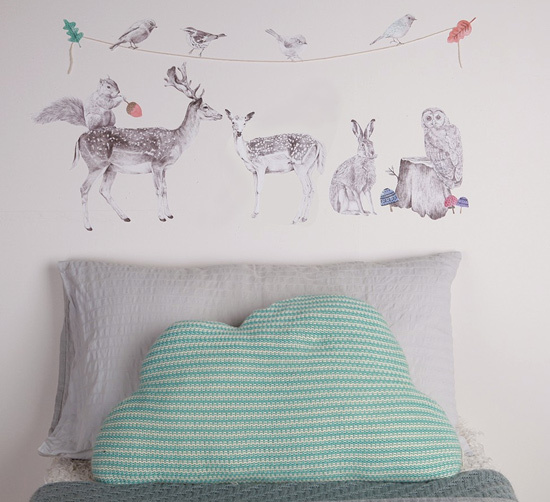 Oh me, oh my, will you look at the new fabric wall decal sets from Love Mae. Just launched this week, these very, very pretty sticker sets will add the requisite touch of sweetness to your nurseries and children’s bedrooms. 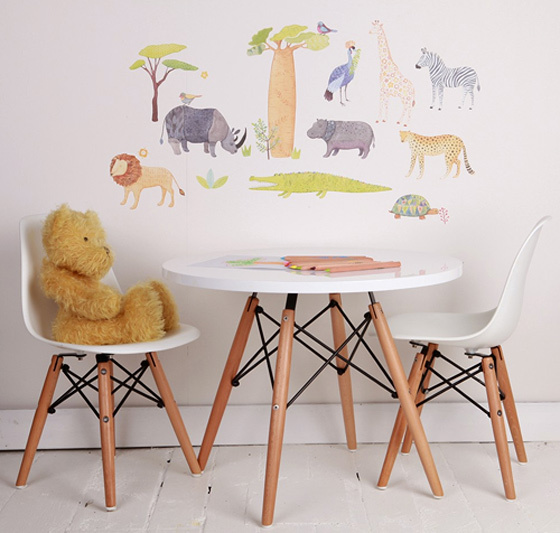 There’s a good whack of vintage appeal that comes with wall stickers from Love Mae. This Australian children’s homewares company – a favourite of ours – has concocted a perfect decal recipe of muted colour palettes, olde-worlde patterns and whimsical drawings, and all three trademark elements combine beautifully again in the latest stack of Love Mae designs. There’s plenty of animal themed designs amongst the ten new decal sets, from the delightfully sweet jumbos in Elephant Parade (pictured top of post) to the slightly more boyish On Safari selection (above). There’s also a farmyard and a forest theme (pictured bottom). All these large animal sets cost $79.95 and are perfect for boys or girls. Little girls with fairy dust in their hearts will adore creating a fairy dell of their own on the bedroom wall. 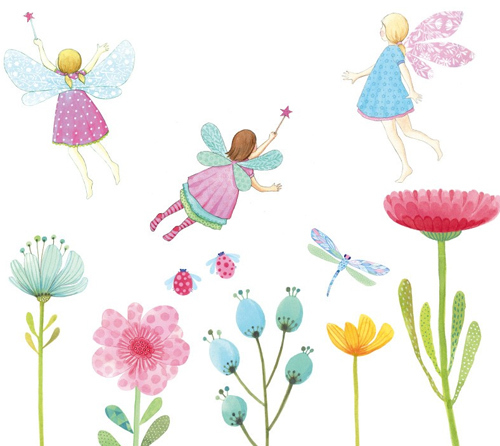 The Fairy Garden decal set costs $44.95 and includes three fluttering fairies, a bunch of pretty flowers and some sweet little insects to boot. Older girls are sure to love the decal dreamcatcher, with its rather bohemian mix of crochet, feathers, flowers and beads. Of course, you can choose this decal just for its good looks, but we also like it for its bad-dream fighting powers that will work on kids of any age. Children love the idea of a dreamcatcher that can catch all their good dreams and let the bad ones out, but often it’s not a good idea to hang something on the wall that might cast “scary” shadows in the half-dark. The Dream Catcher wall decal, we’re happy to report, is one hundred per cent shadow free. It costs $44.95. Pretty Polkadots and Geometric Girly add some shape appeal to the decal line-up, with an eclectic mix of vintage-inspired patterns in either circles or triangles. Pretty, pretty, pretty – and both $44.95 each. And a reminder too that all these decals are removable and repositionable so you can change your patterns whenever the whim strikes. 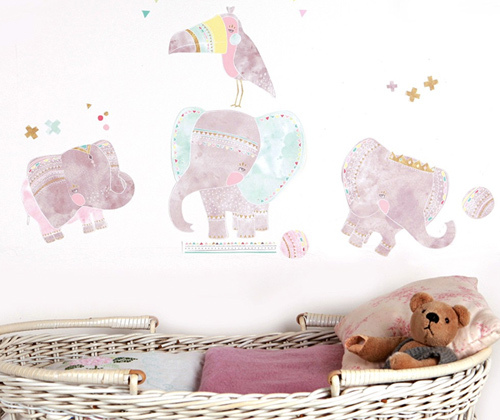 Find all these fabric wall decal sets online at Love Mae, with delivery available across Australia. You’ll find more Love Mae loveliness – from tableware to wallpaper – in our archives, so go on and browse.